Viking Books for Young Readers, 9780451480101, 24pp. Before Ruth Bader Ginsburg, Mae Jemison, Frida Kahlo, and others were change-making feminists, they were . . . babies! What do Ruth Bader Ginsburg, Mae Jemison, Frida Kahlo, Barack and Michelle Obama, Gloria Steinem, Dorothy Pitman Hughes, Billie Jean King, Yoko Ono, and Malala Yousafzai have in common? They're all feminists-- and they were all once babies! This irresistible and timely 7" x 7" board book invites you to lift the flap and discover what your favorite feminist icons might have looked like as babies and toddlers. 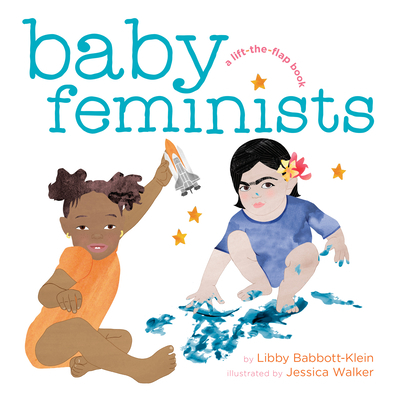 With an inspiring message that any baby can grow up to make the world a better place for all genders, Baby Feminists makes the perfect gift for baby showers, baby-naming ceremonies, birthdays, holidays, and more. Libby Babbott-Klein is a producer and creative director with a focus on activist and political content. She ran the video department for Al Gore's Alliance for Climate Protection, launched a feminist jewelry line (Libby B.K. ), and for over a decade she has been creating content that is rooted in social change and entertainment. Follow her on Twitter and Instagram @libby_bk.